Use a book orientation to introduce the text to the students before reading it for the first time. Discuss the title and encourage the students to share their thoughts on the possible storyline. Examine the front and back covers with the students. Draw attention to the illustrations of the two main characters to predict what the story might be about. Who are Banjo and Ruby Red? What might their relationship in the story be? Ruby Red is looking down at Banjo on the front cover. Why might this be? Does this give us any clues about the relationship between Banjo and Ruby Red? Which is day and which is night? What is in the image that tells us this? Who can you see in the pictures? Can you see Ruby Red? What is she doing? How is she different to the other chickens we can see here? Where is the story set? How can we tell this is a farm? Inquire about student experiences with farms. Have students share their knowledge with each other. Arrange a visit to a local farm, or have some farm animals visit the school, if appropriate. What other information about the story can we get from these pictures? Write these ideas down on butchers paper or the whiteboard to use in discussion after the reading. Ask students about their experiences with animals. Do they have a dog, or perhaps chickens at home? Some students may not have seen chickens before and in that case provide some books or other information (see More Resources for examples). Encourage students to share personal stories with each other to build an understanding about these animals. Check if they know any other words for dogs and chickens, such as the term chook. Students could also discuss the concept of friendship and how they make friends with people or animals. Sometimes they might make friends with someone very different. Focus on the text on the first page – Old Banjo is the best chook dog we’ve ever had. What is a ‘chook’? How are chickens helpful to us? What is a ‘chook dog’? What is Banjo’s job on the farm? How does Banjo look after the chooks on the farm? Banjo and Ruby Red are names the animals have been given. Why do you think the chook is called ‘Ruby Red’? Have students share the names of their own pets and what physical feature or characteristic the name comes from. Students can draw and label a picture of their pet. Explore with students the ways dogs can help us. Consider the roles of seeing eye dogs, pets as therapy dogs, sheep dogs on farms etc. Invite guests into the classroom to share experiences with students, watch videos such as training seeing eye dogs, working sheep dogs or refer to factual texts. Have each student write about the role a particular animal plays in society. Include some photos or illustrations to create a classroom display. Re-read the text and guide the discussion to help students understand that Ruby Red doesn’t act like the other chooks on the farm. While the other chooks walk around and peck at food, Ruby Red likes to sit on her wood pile and be alone. Plan a think-pair-share for the class. Why might Ruby Red like to be alone? Do you ever like to be alone? What do you like to do when you’re by yourself? Ruby Red becomes sick in the middle of the story. Banjo takes her back to his kennel and cares for her until she is well again. Conduct a think-pair-share with the class. Share a time when they were sick. How did you feel? Who helped you get better? What did they do for you? After the oral sharing, have one student write down words describing how you feel when you are sick and the other writing down words describing how you feel when you help someone in need. Finish by having pairs join with another pair and share. Banjo and Ruby Red are friends in this story even though Ruby Red doesn’t always do what Banjo asks. Unpack this theme of friendship with the students. Put students in groups with a copy of the text so they can focus on the illustrations as well as the text. How can we tell Banjo cares for Ruby Red? What does he do throughout the story that shows this? How can we tell Ruby Red cares for Banjo? What does she do throughout the story that shows this? How many people have you shown care for today? What are the ways you did this? Discuss with students the idea of ‘random acts of kindness’. The illustrations give a lot of information about the feelings of the characters Banjo and Ruby Red. Explore the various emotions Banjo displays throughout the story, focusing on the illustrations to support the discussion with students. Create a T-chart with students outlining the different emotions Banjo exhibits in the story and how we as the reader can tell how he is feeling. When Ruby Red refuses to get down from the woodpile? When Ruby Red goes missing? When Ruby Red is sick? When Ruby Red is better and sleeping in the kennel? Conduct a Hot-seat activity, where students question Banjo about the various emotions he experienced in the story. Brainstorm the emotions Banjo experienced in this story. Then invite students to act out the different emotions Banjo experienced in the story. Conduct reflective discussions for students to identify times in their lives when they also experienced these emotions. Has someone ever refused to do something for you? How did this make you feel? What did you do? Have you ever lost something you were responsible for? How did this make you feel? What did you do? Has anyone you care about gotten sick? How did this make you feel? What did you do? One of the strong themes in this text is that of friendship in unlikely places. Banjo and Ruby Red were good friends even though they were different and didn’t always get along. Have students work in pairs to complete a Friendship Venn diagram. Students take turns to identify something about themselves such as ‘I have brown hair’, ‘I like playing soccer’. Ask them to write or draw on a post-it note and place the notes around the Venn diagram. Once the notes are complete, the pair discusses the information and place each note in the correct place meaning the things they have in common go in the interlocking circles while the things unique to Student A go on the left and the things unique to Student B go on the right. This will help students develop a visual representation, which highlights that we can be friends even when we are different. Follow up by reading other stories about unlikely friendships. Pearl Barley and Charlie Parsley by Aaron Blabey or Henry and Amy by Stephen Michael King are good examples. Finish by having students individually create a concept map about friendship. Model the process first either on paper or using Inspiration. Assess by observing the vocabulary each student has developed around this topic. Plan a story sequencing experience for the students. Use photocopies of a selection of illustrations or write the main events on cards and have students order the events as they took place in the story. Students can write a sentence or two in their own words to describe the event. Alternatively, the events of Ruby Red’s rescue can be sequenced using ordinal numbers (first day, second day, etc). Provide students with a template to sequence the events of this section of the text. Introduce students to the text structure of a narrative – orientation, complication, resolution, coda. On the interactive whiteboard or butcher’s paper, identify the key events in the story and list them under the various parts of a narrative. Discuss the function of the coda (gives the final meaning or moral to the story). What could the message of this story be? Do a pair-share before brainstorming as a class. The movements and actions of Banjo and Ruby Red have been shown through the illustrations very effectively. Re-read the story and stop to draw students’ attention to the illustrations on selected pages to highlight this. Focus on the double page which reads ‘Mum whistles and yells…’ Discuss the pictures with the students. How many dogs have been drawn on the page? How many dogs are there? How does the picture give the sense of movement? Look at another double page – ‘Banjo slides on his belly…’ Again, discuss the movement depicted here. Some complementary work on visual literacy might be useful here to explore the techniques in use. For example the use of colour, in particular the browns and reds, the use of vectors leading the reader from left to right and how perspective is used. Students can act out the movements of the characters as these sections are read aloud. Provide some time for students to experiment with this style of illustration for an animal and movement of their choice. Add a description of the movements and create a class display. This activity could also be completed on computers – students can use basic functions to copy and paste images of animals to depict movement across the page. The text contains a collection of simple sentences that feature intransitive verbs in the present tense (Banjo leaps. Logs tumble. Sticks fly. Ruby Red rises). These verbs help create tension in the text. Libby Gleeson also uses transitive verbs which give an image of the character’s actions (stretches her neck, ruffles her feathers, sniffs the long grass). She has used the verbs in the text to paint the picture for the reader, rather then using adjectives. This gives the reader a sense of immediacy and the feeling of being on the farm with Banjo and Ruby Red. There is a lot of farm-specific language used throughout the text, including chook, shed, woodheap, roosts, perch, rounding up, lambing yard, woolshed. Have students complete a Word Hunt activity and locate these words in the text. In small groups, then as a class, define these words, using the text to infer meaning. Make a word wall of these terms and include written and/or visual definitions of these terms. Students can make a model of the farm or paint a mural and label the locations mentioned in the story. The text makes excellent use of onomatopoeia, which adds to the development of character and tension throughout the story. Discuss this language feature with students and give examples by watching this video. Explore other texts where this technique is also used. As a culminating activity, have students author a page to be collated as a class book depicting the various animals and the sounds they make which could be found on the farm with Banjo and Ruby Red. Alternatively, students could focus more broadly and consider animals in other environments – at the zoo, in the bush, in the jungle. After rereading the story, have students create some simple masks of Banjo and Ruby Red. Students can take on the role of Banjo or Ruby Red and act out the story. Encourage students to use their understanding of the characters from previous discussions to depict the various emotions encountered through the story. How does your character move? What does your character’s voice sound like? Would you talk quickly or slowly? Is your voice loud or quiet? What things might your character say? How do they interact with other animals on the farm? Allow students some time to explore being the character. Students could perform scenes from the story for the class or in small groups. These could be recorded on iPads to watch later. As a comparison, have students use their masks (or make some simple finger puppets) and recreate different versions of the story – the original, and the versions written by the class. Discuss the differences in the way the characters act and how this felt for the students. 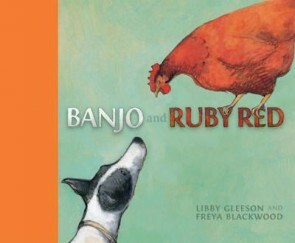 Banjo and Ruby Red could be considered ‘unlikely friends’ in this story. Share some other books which tell the story of two unlikely friends (see More Resources for examples). Students can write their own story of animals who are ‘unlikely friends’ with teacher support. As a culminating activity, reflect with the students on the experiences of Banjo and Ruby Red throughout the story. Prompt the students to focus on the actions of one of the two main characters and view the story from this character’s perspective. Why did Banjo bark at the chooks like that? Why did Ruby Red stay on the woodheap? Why did Banjo go looking for Ruby Red? Why does Ruby Red now sleep in the kennel with Banjo? The story is not told from the perspective of Banjo or Ruby Red, but from a child who lives on the farm. Consider how the story might be different if it were told by Banjo or Ruby Red. Enlarge photocopies of the illustrations and have students retell the story from the viewpoint of Banjo or Ruby Red. Compare these new versions to the original text. How does this change of perspective change the key events in the story? Do we see the characters in a different way? Libby Gleeson and Freya Blackwood have collaborated on several texts. These could be used in the classroom to form the basis of an author/illustrator study. Their books include Amy and Louis, Clancy and Millie and the Very Fine House and Look! A Book. Read more about Libby Gleeson here. Find out more about Libby Gleeson and her picture books here. Discover more about illustrator Freya Blackwood. KYLIE ROBSON is an experienced primary school educator, Literacy Coach and University lecturer with over 15 years of teaching experience. She is an Executive Teacher with the ACT Education and Training Directorate and currently works as a Clinical Teaching Specialist at the University of Canberra, where she specialises in Literacy and Mathematics Education. She is undertaking a Master of Education and her research interests include effective strategies for teaching writing and incorporating quality children’s literature into the Mathematics classroom. Kylie is an active member of the ACT ALEA local council.